All giraffes come from the same family, Giraffidae, in the real world. They enjoy similar grumpy old faces, flaunt tails that seem to serve no purpose and necks and legs for which the word ‘long’ falls short of length. 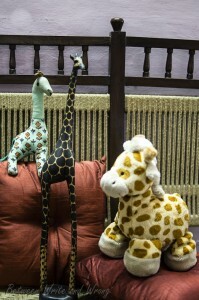 These 3 giraffes you see lounging on my settee were adopted by us over the last year. They look different from each other – in colour, size, make, material, as they happen to come from different countries. The wooden one is from Nigeria, the yellow from the US and the green one is hand-made in India. But that’s about it. Essentially, they are all giraffes. G for Giraffes. Just like we from different countries and continents are all humans. H for Humans. Then, since we all belong to one big homo sapien family walking the planet, why not get together in a closer circle? Why not open the windows of our houses freely to see and perhaps welcome in cultures and ideas that we call ‘foreign’? Why not expose our children to traditions from parts of the world other than ours, which might just make their lives better informed, more interesting and certainly closer to unknown shores? Look around. We live in a touchy and touch-me-not world. Religion, family values, caste, creed, culture and class are to be protected at all costs. They are like vulnerable beings requiring our defense at the drop of an unkind remark. Languages and ideologies from seven seas away are looked at with suspicion and a mild undercurrent of xenophobia is allowed to live inside most of us. Closer home, even as we cheer like one united country during an India v/s Australia match, the moment the last ball is bowled and the flags on the faces washed away, we forget that oneness and return to reveling in and asserting the various labels of caste, class and gotra our Indian identity comes wrapped in. It’s not that things are not changing for the better. When once people of two different religions did not break bread on the same table, today they get married and make babies together. Derogatory words for racial minorities are considered just that – derogatory. Schools, colleges, offices see people from all backgrounds and ethnicities rubbing shoulders together. And friendship in the virtual world, is virtually free of identities based on man-made differences. Just like the unconditional friendship between these 3 giraffes in the picture and their friendship with my son. As I see him playing with them, I think to myself. Does it really matter where they came from, or what language they would have spoken in their animal world? The 4 of them seem absolutely at peace with each other. Should not all relationships transcend shadow lines of maps and shoe-boxes full of discriminatory labels? And most importantly – Should we not, as parents, make sure our children do not develop any ideas of ‘us’ and ‘them’, usually with a disturbing ‘versus’ in between the two words? Different cultures have much to show us to entertain us and even more to teach as we go along living life within our own comfortably created systems. Nothing gets lost or compromised by opening our minds to different ideas, as protectors of all things Indian believe. If at all, something new gets born – something that is more colourful, more meaningful and certainly more humane. Even as we raise our children imparting them with values, beliefs and cultural norms that our families have borne down the ages, we can learn to admire, if not adopt practices from other countries as well. And then, if our adopted traditions can carry so much meaning, what makes us think that the alien ones cannot? For instance, take parenting traditions and habits from across the world. One knock on Sir Google’s door and look what he has to tell us. In Sweden, parents visiting cafes will put their babies to sleep outside in -10 degrees in their prams, parked in a row, even as they sip their cuppa inside. Unusual? Yes, but it is widely believed in Scandinavian countries that fresh air is magic for tiny immune systems and babies are less likely to catch colds from being in the same room as other children. The Japanese schools allow quarrels to continue knowing that by letting the children fight it out they are learning to develop social adaptability and independence of sorting things out. In Vietnam, children throw their broken milk teeth on their roof tops, wishing the tooth to become the tooth of a mouse, as rodent teeth grow for their whole life. A children’s park in Denmark has trees where children hang their pacifiers from branches as a ceremonial way of saying goodbye to them. Some of the above would sound bizarre and even cruel to an Indian parent’s eyes, only if we did not dig deep enough to understand the reason behind them. All of the above have their own streams of common logic running beneath them. And that gets me back to the point I began with. Acquainting ourselves and our little ones to foreign customs and traditions can make us see and understand our neighbours, even as it makes them grow to respect the sameness within that difference, a sameness that tags of race, nationality, caste or creed cannot colour over. H for Human will always come before I for Indian. It’s the need of the hour. Even as we prepare our children for the future, we can do a tiny bit to prepare the future for our children too. The 3 giraffes. And just a thought.